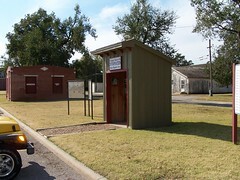 Established as Camp Supply in 1868 in the western part of the Cherokee Outlet, this supply base served General Philip Sheridan's winter campaign against hostile Indian tribes of the southern Great Plains. 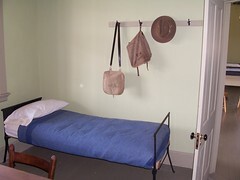 The fort was also responsible for protecting the Cheyenne and Arapaho Reservations from incursions by whites, and for protecting travelers and southern Kansas from hostile tribes. 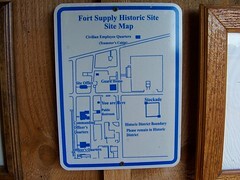 The camp's name was changed to Fort Supply in 1878 when it was set up as a permanent military post. 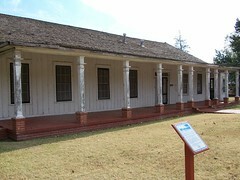 The fort's troops participated in territorial land openings in the 1880s and 1890s, and in the Cherokee Outlet land opening in 1893. 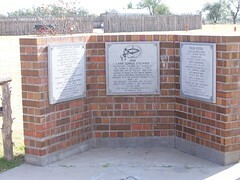 It was closed as a fort in 1894. 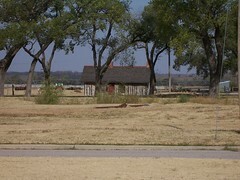 Today, the Oklahoma Historical Society administers five buildings and a replica stockade at the Fort Supply Historic Site, along with living history events and programs. 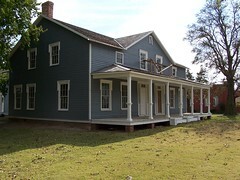 Listed on the National Register of Historic Places, the fort is open to the public. 12 miles NW of Woodward on Hwy 270. 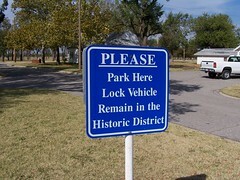 Free Admission, Tour Group Services: Tour Bus Parking, Open: May 1 to October 31 9:00 AM to 5:00 PM.